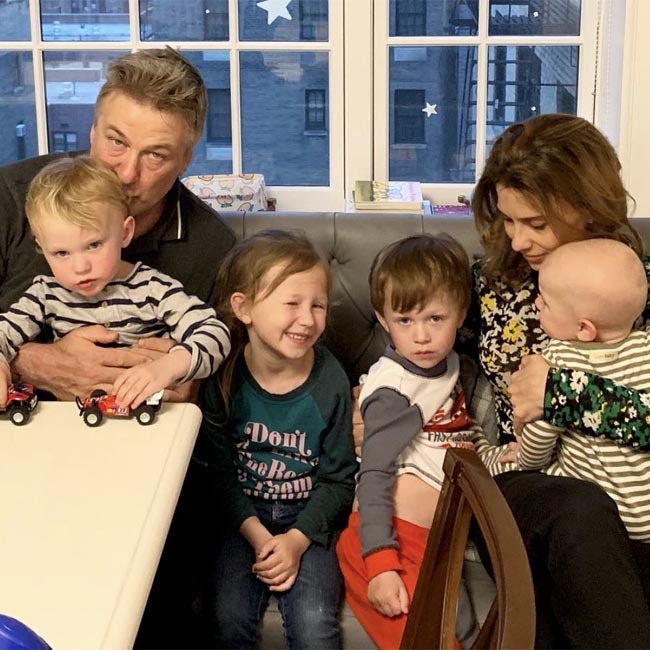 Hilaria Baldwin has confirmed she has lost her baby after revealing she might have been going through a miscarriage. The 35-year-old health and wellness expert had revealed last week that she was expecting her fifth child with actor husband Alec Baldwin - with whom she already has Carmen, five, Rafael, three, Leonardo, two, and Romeo, 10 months - but accompanied the Instagram announcement with the tragic news that she was "most likely experiencing a miscarriage". Hilaria has now sadly revealed that there was "no heartbeat" when she went for her scan this week. The author said she is "fortunate" to be "surrounded by such love" and thanked everyone for the outpouring of support she has received since sharing her devastating story with the world on social media. Alongside a picture with her children and the 'Rock of Ages' star, who she hailed "pretty strong and amazing heartbeats", Hilaria wrote: "There was no heartbeat today at my scan...so it's over...but I have some pretty strong and amazing heartbeats right here. I am surrounded by such love and I feel so fortunate." The author recently explained how her decision to speak up throughout the process is because far too many women go through the grieving process in silence. She said: "With pregnancy, you're trained not to say anything about it for 12 weeks - the first trimester - when the risk of miscarriage is the highest. There's superstition, but there's also the fear that you might do something wrong and lose the baby. And that if you lose the baby, people are going to blame you, for eating the wrong way, for sleeping on the wrong side, for exercising too much or too little ... the list goes on. "Even before I got pregnant, I thought about what it would be like to have to share news like this. Having a miscarriage would hurt if I went through it in silence and it would hurt if I lost the pregnancy in front of everybody, I realised. At least sharing my story might help me and other women dealing with a miscarriage to find support." Hilaria has worried about miscarrying with each of her previous four pregnancies, and felt that she shouldn't stay quiet because she and other women like her need to do "whatever they need to heal". She added in an essay for Glamour magazine: "Pregnancy loss is a topic that touches almost everyone - 10 to 25 percent of all known pregnancies end in miscarriage. I'm not surprised at how common they are. Almost every single one of my friends has experienced some kind of struggle with infertility or miscarriage. I had such a fear of miscarriage with each of my pregnancies that I'd google the probability of miscarriage each day. And yet we're still so quiet about it. For me, this doesn't make sense. I understand why some women choose to keep this pain private, but it's such a personal thing - some people need to process the loss on their own, and others need to process it more publicly. Women deserve to have the option to do whatever they need to heal. (sic)"
The beauty made her miscarriage concerns public last week when she posted a picture of her small baby bump, and said the chances of her having a fifth child this time around are "very very small".